on for today -- our wedding anniversary. even swans swimming close by the patio. tomorrow. Let this day be about love. It was and is a Happy Anniversary. Labels: Our anniversary. A wonderful day. Congratulations, Barbara. I can feel you joy from this far away. You are so blessed. Happy anniversary to you and Steve. Your present portrait glows with happiness as did you past. Wishing the both of you many, more glorious years. That beautiful, illuminating smile hasn't changed. This is so great. Beaming and heart-dancing along with you. Happy Anniversary to you both! Congratulations. I agree with with Laura, your smile is still sparkles! Thanks so much. Love the new bird. Thanks for the beautiful flowers. And thanks for the happy wishes. The only thing that's changed, is that I have more of a sense of humour than the girl who married my husband. I'm pretty sure he's always liked the fact that I like funny people, but I am much funnier now than when we met. I was sooooo serious. Thanks so much. We are a pretty lucky pair. It is great good fortune to have people around you who teach you how to be loving. It was a super day. Thanks so much. I am delighted that you see that. I'm smiling right now reading your message. Congratulations you two. You make a great team. No art today huh? Not to worry! It's nice to come in here and see your smiling face too. I hope your day was fantastic. Happy, joyous anniversary to you and Steve! Your photos radiate with happiness and beauty! Thanks so much. It's wonderful to know there are friends like you in the world. Thanks so much. I feel more than lucky to have a happy life. Thanks for being part of that happiness. My sincere (and late) congratulations to you and Steven. What a beautiful couple you make. 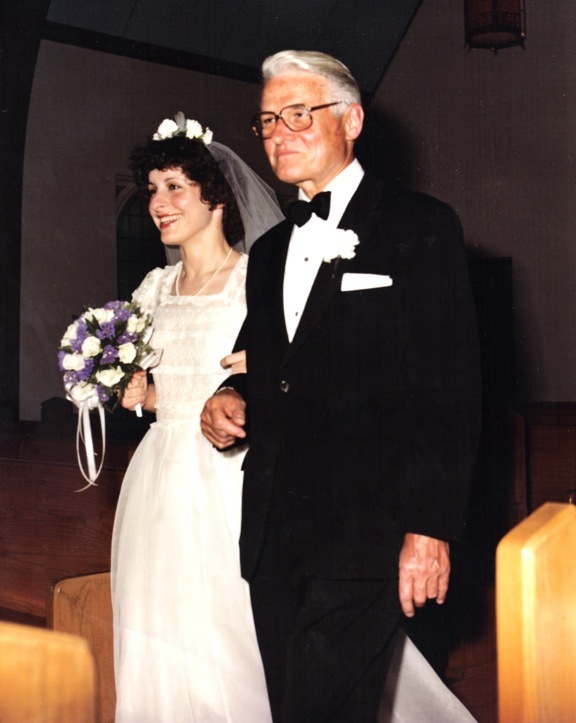 Thank you for sharing that nostalgic photo of you as a bride on your father's arm.